Studying a language is one of those experiences that are remembered throughout life. Learning Spanish is also an opportunity to know the culture of the country, its traditions and of course, to make friends. On the Costa del Sol there are many places to experience this process of assimilation. 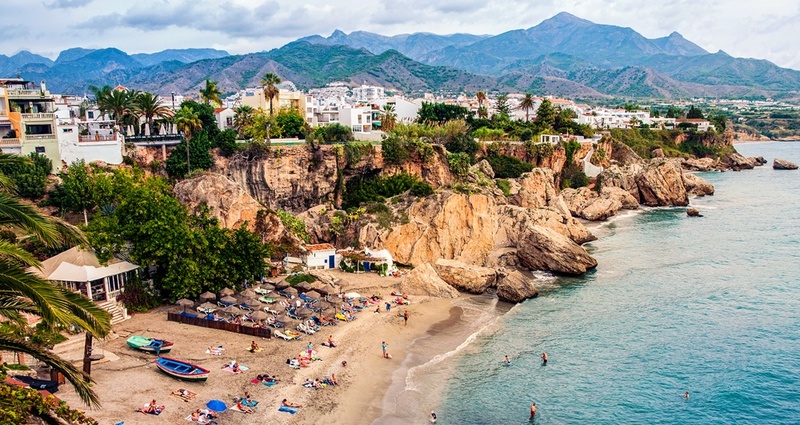 One of them is Nerja, the town where the well-known Balcon de Europa is located. What does Nerja have that makes it so special? Nerja is a perfect combination of authenticity and a character open to the world. It is a quiet and, at the same time, cosmopolitan town. Did you know that last year it was declared the most charming town on the Spanish coast? Here you can stroll through beautiful typical Andalusian streets or enjoy spectacular coves between cliffs, to highlight some of the attractions of this municipality. The paradisiacal beaches of Maro are in fact the most idyllic ones in the country. In addition, Nerja has two musts. On the one hand, if you walk along its promenade you will arrive at the famous Balcon de Europa, a spot that overlooks the Mediterranean from a small rocky cape that goes into the sea. On the other hand, the municipality can boast of having one of the most impressive caves in Europe: the Cueva de Nerja. There, you can contemplate what is said to be the first work of art of humanity and also the largest natural column in the world: the gigantic column of the Sala del Cataclismo. Schools, such as Centro de Idiomas Quorum or the Escuela de Idiomas Nerja, offer a complete curriculum to learn Spanish, as well as interesting exchange programs, accommodation and other cultural and leisure activities to enjoy Nerja and its surroundings. Some of the parallel activities that you can carry out are cooking workshops, wine tastings, visits to the caves of Nerja, Spanish cinema sessions, sea kayaking routes ... besides, of course, the hospitality with which you will be received by the people of this charming town and the ease you will find to make friends. Come to Nerja and have fun learning Spanish! Nerja is less than an hour from Malaga capital. The airport of the capital of the Costa del Sol is one of the most important and best equipped in Spain. From Malaga, you can take a bus that will take you directly to Nerja. The frequency is very high, every 20 minutes. In addition, some schools offer for students who request a transfer service from the airport to their accommodation in Nerja.